Fabric markers are a convenient way to add a personal touch to your clothes and accessories. They allow you the freedom to use your imagination. Versatility, durability, and convenience are just a few of the benefits they offer. Selecting the right set of fabric markers can be crucial to the success of your project. From experimenting on test clothes to trying several brands, we have all been there to get our hands on the best. 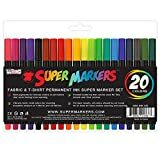 This guide will bring out the essentials that you must keep in mind to get your hands on the best fabric markers. 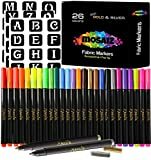 Gel pens: Gel-based fabric markers are ideal for drawing in small spaces, writing letters on fabric, and outlining. They are not suitable for filling large spaces. Paint pens: These are ideal for filling large spaces. They can also be used to create elevated designs and flat lines. Ink pens: These can only be used to make very thin lines, and are generally used for the purpose of marking the fabric before cutting or sewing. The color comes off easily after the first wash. Reliable brands: Most users recommend sticking to reliable brands. This is one way you can be assured of the quality and durability of the finished product. A product from a standard company will provide vibrant, permanent colors to your design that will not fade after a few washes. 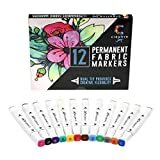 Instructions: Most users appreciate fabric markers that come with clear instructions. Clear, detailed instructions make for comfortable use and save you the trouble of extensive research before you proceed with actual coloring. 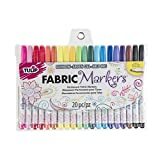 Tip of the marker: After going through thousands of fabric marker reviews, we conclude that most users recommend that you should ensure that the tip of the marker is firm and non-fuzzy so that it does not run on the fabric. Tips should not shed with use. There are several types of fabric markers available on the market. You may be looking for a thick brush-style tip or a fine tip or may be on the lookout for a fabric marker that goes well on stencils. Whatever might be your reason to use a fabric marker, here are certain aspects that you should check before zeroing in on one. 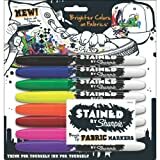 Opt for non-toxic markers: Whether you are buying fabric markers for personal use or for your kids, it is always better to opt for non-toxic markers that are safe to use. 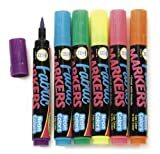 Choose markers with fade-resistant ink: You should buy markers that do not fade easily, even after multiple machine washes. You can check product specifications and go through reviews to see how the product performs after a wash.
Avoid heat setting markers: Some markers do not require heat or ironing to set the colors permanently. They are convenient to use and don't require ironing before the first wash. They dry quickly to give the perfect finish. Ensure smooth application: The marker should run smoothly and evenly without snagging on the fabric. 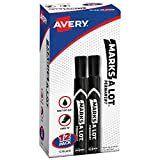 Very dry markers can be difficult to spread over large areas, while runny markers can cause bleeding and may take longer to dry. Again, you should check product specifications and read reviews to be sure about how to apply the markers on fabric. 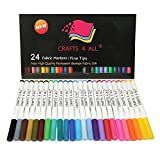 Buy a variety of tips: Having markers with a variety of tips will allow you to fill designs and paint without any interruptions. 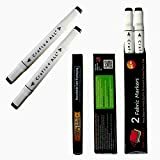 Fabric markers usually come with a variety of tips, including wide-angle chisel, brush, bullet, and fine-point; you should choose the marker tip according to your requirements. 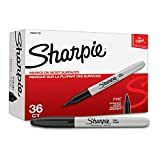 Sharpie: Established in 1857, Sharpie is the market leader in this segment. They manufacture a wide range of products to meet the varied requirements of customers. 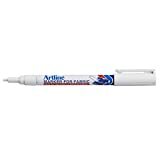 Sharpie is known for the quality and reliability of its products. Tulip: Tulip is a well-known manufacturer of fabric markers. From serious craft enthusiasts to amateur DIY’ers, Tulip is a favorite among customers of all ages. Their fabric markers deliver the promise of fast, long-lasting color to your designs. Dritz: Established in the early 1900s, Dritz is a brand committed to delivering quality and value to its customers. 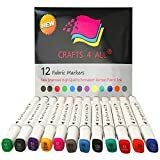 The fabric markers manufactured by this company are what you need to bring your designs to life.